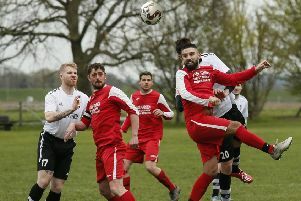 Tring Athletic moved up four places in the SSML Premier Division table with a 3-1 win over basement boys Bedford. Athletic were 2-0 ahead after a quarter of an hour, and home supporters must have been rubbing their hands at the prospect of a goal-fest. But Bedford had other ideas and, despite their disappointing start to the season, they rallied and made Tring work for the points. Athletic opened the scoring after only 12 minutes when Sam Joliffe released Ollie Hogg down the inside left channel and his first time cross was superbly volleyed home by Chris Vardy. That was quickly followed by a second goal three minutes later when the Bedford keeper failed to clear a through-ball while under pressure from Vardy, and Hogg coolly slotted the ball past desperate attempts of the defenders to get back. The Bedford keeper then just got his finger tips to deflect away a lob from Vardy, before a Kevin McManus header from a Jack Sunderland cross cleared the bar. It took a while for the visitors to get in the game but gradually they grew in confidence and played some nice football. In the 37th minute they had a great chance to reduce the arrears following a break by Derek Joseph, who laid the ball off to James Hilsdon who shot just wide from a promising position. The first period ended with Hogg hitting the post and, although Athletic had a commanding 2-0 lead, Bedford were buoyed by a confident finish to the half. The Bedford keeper made a brilliant save from young Jack Westlake at the start of the second half to keep his side in the game. The chances continued to come Athletic’s way, with a shot from Westlake cleared off the line and McManus heading a free-kick over the bar. The opposition were still in the game and their left back Billy Penney zipped a long range shot not too far wide of the post. Athletic needed a third goal to quell their opponents and it duly arrived in the 76th minute as Kieran Turner and Chris Mason linked up superbly for the former to slip the ball past the keeper. But Bedford kept going and were deservedly rewarded with a goal a minute into added time when Jack Boyd latched onto a loose ball in the area and cracked a shot high into the net. Tring: Liam Smith, Jack Sunderland, Bertie Squires-Adams (Ryan Sturges 74), Dan Steadman, Kevin McManus, Sam Joliffe, Chris Mason, Ryan McMahon (Luke Dunstan), Chris Vardy, Jack Westlake (Kieran Turner 62), Ollie Hogg. Subs not used: Stuart Stedman, Matt Evans. Bedford: Louis Porcelli, Dean Dummett, Billy Penney, Sima Soren (Joshua Luther 56), Oliver Swain, James Hilsdon, Derek Joseph (Kai Bucciero 72), Jason Darvall (Sulliman Bakalandwa 77), Charlie Gregory, Alfred Mogabo, Jack Boyd.